Brian Baumgartner is an American actor who is known for his ability to send movie-goers into fits of laughter. An extremely amusing man, Brian knows how to make hilarious facial expressions that leave fans totally cracked up. Having been in the industry for several years, Brian Baumgartner has won over many fans to himself and has solidified his place as one of very exciting Americans to watch on TV. As an actor, Brian Baumgartner is now best known for the dimwitted character he played as Kevin Malone in The Office, a popular American TV series. His character in The Office made him very popular among fans who found him completely hilarious. Brian Baumgartner was born on the 29th of November in 1972. The actor was born in Atlanta, a popular city in Georgia, USA. The identity of his parents has not been revealed just yet. Also, we don’t have any details about whether or not he has any siblings. However, we know that he grew up in Georgia with his family. Growing up, Brian Baumgartner attended The Westminster School, a private school in Georgia. After graduating from The Westminster School, he went on to attend Holy Innocents’ Episcopal School, a college-preparatory day school in Sandy Springs, Georgia. Brian Baumgartner then attended the Southern Methodist University, a private research university which is located in metropolitan Dallas. He graduated from the university with a BFA in acting in 1995. Following his graduation, Brian Baumgartner moved to the city of Los Angeles where he took up a job at Hidden Theatre, a theatre in Minneapolis, Minnesota where he served as the Artistic Director. While on the job, he received awards for his acting prowess and artistic excellence. Brian soon started acting regionally at the Theatre de la Jeune Lune, the Guthrie Theater, the Children’s Theater Company, and Berkeley Repertory Theatre winning lots of accolades for his acting ability. With his theatre acting credits increasing, the actor soon branched off to TV. Brian Baumgartner kick-started his movie/TV career in 2001 when he was cast in Herman U.S.A., a romantic comedy in which he played Roger. Two years later in 2003, he appeared in The Lyon’s Den, an American legal drama TV series and CSI: Crime Scene Investigation, a procedural forensics crime drama TV series that aired on CBS. After appearing in LAX, a fictional TV drama in 2004, Brian Baumgartner went on to star in three TV series in 2005 namely; Arrested Development, a TV sitcom, Jake in Progress, a comedy series and Everwood, a drama TV series. Brian Baumgartner got his biggest break on TV in 2005 when he joined the cast of The Office, a TV sitcom which aired on NBC. He portrayed the dimwitted character of Kevin Malone on the series and got many fans cracked up with his hilarious schemes on the show. The show launched the actor into unprecedented fame and endeared him to many TV fans. He starred on the series for about 8 years till 2013 and appeared in as many as 201 episodes. 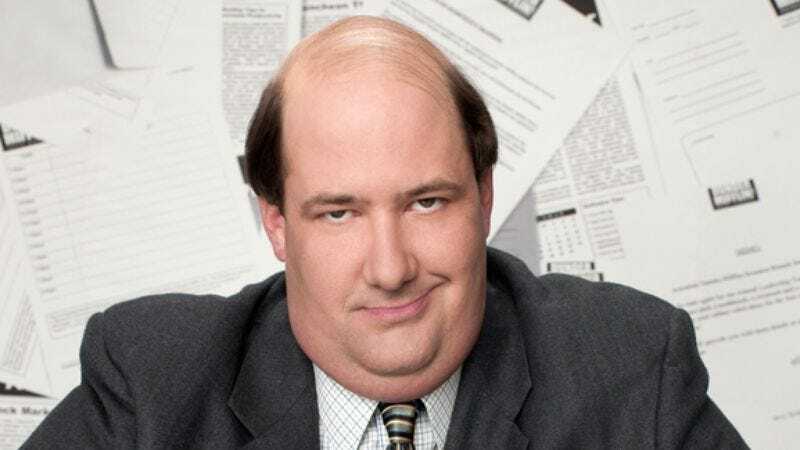 After landing his role in The Office, Brian Baumgartner went on to feature in other topnotch series like Celebrity Family Feud in 2008, Adventure Time in 2011, Hot in Cleveland in 2013, Nicky, Ricky, Dicky & Dawn in 2015 and Life in Pieces in 2017. Baumgartner and his wife, Celeste Ackelson at an event. Brian Baumgartner is a married man. The actor is married to a woman identified as Celeste Ackelson. The couple got married in April 2014 at a ceremony in Los Angeles which was attended by family and friends. Brain and his wife, Celeste had their wedding reception at the Wilshire Country Club also in Los Angeles. The couple has remained together ever since. Their union has been blessed with a daughter whom they welcomed the next year in 2015. They named the girl Brylee Bea Baumgartner. The actor took to his social media page to announce the arrival of his baby to the excitement of his many fans. Having been in Hollywood for quite a while and having stunned the world with his acting prowess and winning lots of accolades in the process, it is expected that Brian Baumgartner has made a fortune for himself over the years. The actor has appeared in several high-ranking series and movies and these have fetched him money over time. Currently, Brian Baumgartner’s net worth has been pegged at a whopping $6 million. Brian Baumgartner is a tall man and usually towers above people when he stands with them. The actor now stands at 6 ft 1 inch in height. In addition to this, he weighs about 250 lbs. This, of course, is bound to change with time.